Philadelphia Eagles wideout Nelson Agholor. This time last year, Eagles wide receiver Nelson Agholor had a paltry career 59 catches, 648 yards, and 3 TDs in his first two seasons, despite starting 26 games. He was also responsible for taking two touchdowns off the board by not lining up correctly and had his share of egregious drops. It wasn't just that he wasn't making plays. He was actively hurting the offense even when not involved in the play. Many (self-included) considered him a bust. That all changed in 2017. Last offseason, the Eagles found a pair of wide receivers in Alshon Jeffery and Torrey Smith to play on the outside, traded Jordan Matthews, and moved Agholor into slot. In his new role, Agholor flourished, catching 62 passes for 768 yards and 8 TDs, while making a number of highlight reel plays along the way. Oh, and he also had nine catches in the Super Bowl on 11 targets. 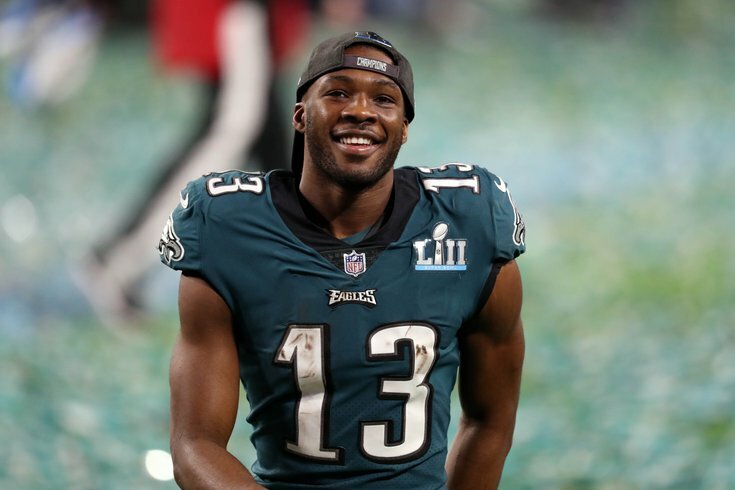 Agholor went from a guy in danger of losing his job completely, to a player the Eagles will likely choose to keep under their control though the 2019 season by exercising his "fifth-year option." Players drafted in the first round who have completed their third year in the league are eligible to have a fifth year added onto their contract by their team. It isn't cheap. For players drafted in the top 10, the cost of the fifth year is the average of the top 10 salaries in the NFL at that player's position in the fourth year of their contracts. For players drafted anywhere in the range of 11th to 32nd overall, it is the average of the third-highest paid player to the 25th-highest paid player at that player's position in the fourth year of their contracts. Agholor was drafted 20th overall, so he would fall into the latter bucket. In 2017, the cost for exercising a fifth-year option for a wide receiver in the 11-32 range was $8,459,000. That will likely rise a bit in 2018. One important caveat to note is that the fifth year salary does not become fully guaranteed until the first day of the new league year in the player's fifth year (in Agholor's case, sometime in March of 2019). It is fully guaranteed for injury, however. As in, if say, a player tore his ACL late in his fourth season, that fifth-year option would become fully guaranteed. So should the Eagles exercise Agholor's fifth-year option? Yes, they should, as noted above. You may be asking, "Is Agholor really worth a little less than $9 million in 2019? Is he really worth the average of the third- to 25th-highest salary in the NFL at the wide receiver position?" Over the course of a long contract, no, he's not, at least not yet. But that's not the way to look at it. The benefit is that the Eagles would keep him under their control for an added year, and with Agholor having finished his third year in the league, the Eagles would be eligible to negotiate a contract extension at a time when his long-term cost would be reasonable, should Agholor be open to an early extension. The Eagles have a good thing brewing at wide receiver for the first time in a long time. Alshon Jeffery is their "No. 1," Agholor is the slot, and the team has some youth in the pipeline in Mack Hollins, and to a lesser degree, Shelton Gibson. To be determined what Torrey Smith's future is with the team. Jeffery and Agholor alone, paired with Zach Ertz, present a formidable trio for opposing defenses to have to defend in the passing game. I'm sure the Eagles would love to know that they have all three in place for the long haul. Jeffery's and Ertz's deals are already done. The only real risk the fifth year option presents is if Agholor were to revert back to his level of play his first two seasons with the team, and then also sustain a serious injury during the 2018 season that would carry over into the beginning of 2019. Without the injury, they could simply release him prior to March of 2019, and would not be on the hook for the fifth year option at all. With such an injury, they'd be on the hook for the $9-ish million. But certainly, the benefit of keeping Agholor under the Eagles' control for the added year outweighs the risk of a precipitous drop off in play, plus a devastating injury.